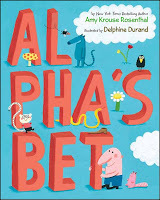 Teaching With Love and Laughter: Al Pha's Bet...with a freebie! Al Pha's Bet...with a freebie! This is one of my favorite back to school books! It's called Al Pha's Bet, written by Amy Krouse Rosenthal. She also wrote The Spoon, which is a great book, too. Al Pha's Bet takes place long ago, when many things were being invented, like fire and the wheel. A man named, Al Pha, made a bet with himself to put all 26 letters of the alphabet in order. The king was looking for someone to do this daunting task, and Al Pha really wanted to be a part of history. Through a series of funny events, he found the perfect order for the letters, and the king rewarded him by naming his creation the Alphabet. It's such an amusing book and my students always want me to read it over and over again. Following the story, my students wrote about the book. Some wrote about how they would arrange the letters of the alphabet and some just summarized the book. 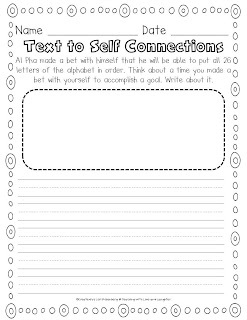 I made a text to self connections sheet to go with the story. My students think of a time they made a bet with themselves to accomplish a goal. Then, they write about the goal they wanted to accomplish and how they were able to achieve the goal. If you would like to do this activity, just click on the image below. I hope you enjoy this story as much as I do! OK, that reflection sheet it totally adorable! I love Amy Krause Rosenthal, especially her Cookies series!! Haven't heard about this one yet though it sounds fun. Thanks so much, Barbara! The book is really amusing! Enjoy! I've never heard of that book before. Thanks for the recommendation! Thank you for the freebie! It will be great to use next year with my kinders! The book is new to me. Thank you for sharing. This sounds like such a great book. I'm definitely going to add this to my Amazon wishlist. Ahh, if only I had unlimited funds. Great lesson idea too. 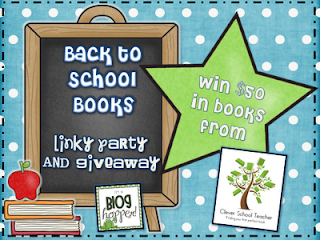 I'd love for you to link up with my weekly linky party, Fiction Friday: A Celebration of Children's Literature. What a terrific freebie! Thank you for sharing this at TBA and linking up! I'm glad you all like it! Trust me; it really is a cute book! 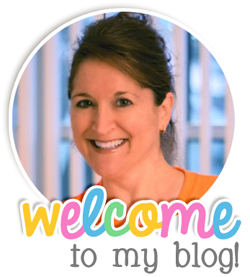 Come on over to my blog when you can! Thanks for linking up and sharing your great idea! If you have a sec to add my linky button to your post to connect others with Fiction Friday that would be awesome! I'm trying to spread the word as much as possible and love learning about so many great books! Thank you!! 500 Follower Giveaway! It's a B-I-G One! Do you think I'm too casual?